Google Chrome browser, without a doubt, is the fastest and most powerful web browser out there for Windows. Google Chrome, which was released back in 2008, has managed to catch up with the once best Mozilla Firefox. 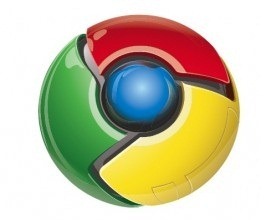 Google has regularly been updating Chrome to fix issues and add new features. As we reported earlier, with Chrome v4.0 Google introduced Bookmarks Sync feature to help users who use Chrome browser on more than one machine. 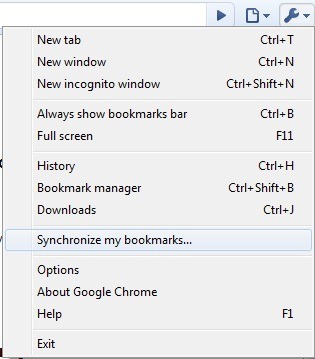 For instance, if you’re using Chrome at your as well as your Office, you can use the Bookmarks Sync to keep the same set of bookmarks on both the machines. 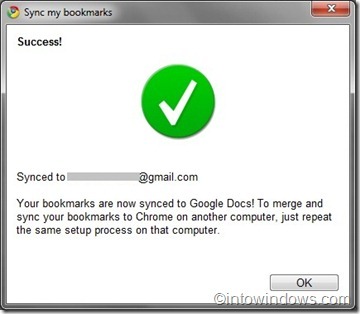 And when you add/delete a bookmark, Bookmarks Sync automatically updates the bookmarks list saved on another machine. Bookmark Sync feature makes it easy to keep the same set of bookmarks on multiple computers. 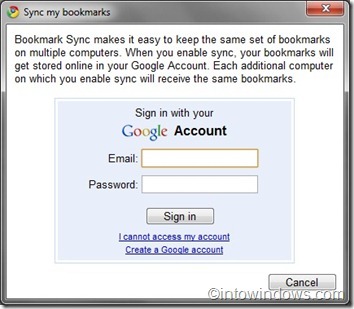 When you enable sync, your bookmarks will get stored online in your Google Account (of course, you need to have a Google (Gmail) account). Each additional computer on which you enable sync will receive the same bookmarks. 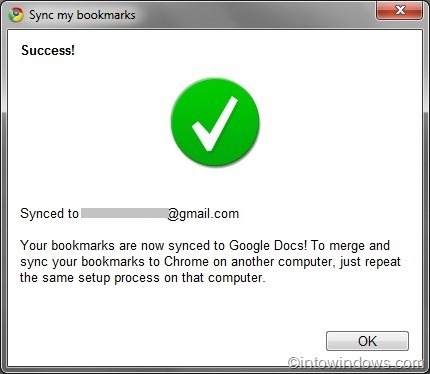 If you have installed Google Chrome, here is how you can sync your bookmarks between your computers. Step 1: Run Google Chrome browser. 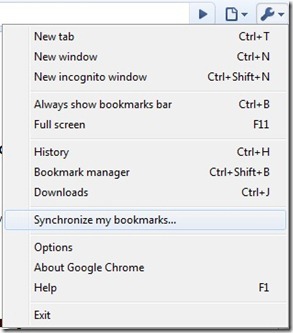 Step 2: Click on the wrench menu and select Synchronize my bookmarks option. Step 3: Enter your Google (Gmail) Email ID and password. Click Sign in button to start synchronizing bookmarks. Step 4: Wait for a few seconds to see the success message. Step 5: Now your bookmarks are stored in your Google account. Step 3: Enter your Google (Gmail) email ID and password. Step 4: You will be asked to confirm that your different sets of bookmarks should be merged together. Click Merge and sync to finish the syncing process. 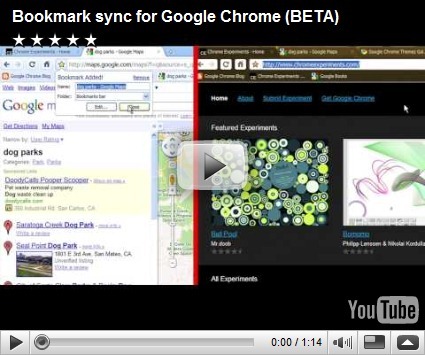 You can also watch this official video that shows you how to sync bookmarks between multiple PCs. 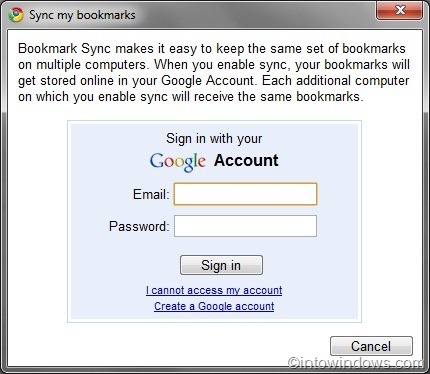 when you Sync Chrome to your google account, the old copy will sync to your current browser and you will loose all your most recent settings and bookmarks if not passwords and plugins as well. i just copped this. Its so frustrating that you cant choose which things take priority in the synch..
1. restore from an old sync backup. they still have not worked it out.